Boy have I been through that verse in my life. Being in need, to having more than enough, feeling fear of my children going hungry, to having plenty of food to share. I have seen The Lord’s strength in me, in each situation. Learning the lesson of contentment with what He gives me, has been such a blessing in my life. I now know to place my happiness in Him and not the things I have. That is not to say God doesn’t want us to enjoy our earthly treasures, or the things He has allowed us to have. He wants us to delight in what we have, make the best of our current situation, whatever or whereever that may be. I take this thought to heart when it comes to decorating my home. It would be easy to allow myself to feel frustration that I have financial limits when it comes to decor. It would be easy to feel jealous of others beautiful pictures that I see, knowing they are purchasing new chairs from Pottery Barn, a dining room table from Restoration Hardware and lighting from One Kings Lane. However, I choose to be happy for them and focus on what I can do, instead of what I can not. Take this dining table setting for instance. I was inspired by a similar table at The Country Living Magazine, antique fair, a few weeks back and I just “needed” to have it! As I added up in my head what it would cost to purchase all the items from the vendor to recreate this in my home, I quickly realized it would be out of my budget. I could get sad and just forget it, or I could get creative and make it come to fruition! By choosing contentment with what I had, I found I liked the final result even better than the inspiration! Rather than purchase items that had no personal connection to me, I used pieces that were part of my family past, or items that had their own history. This tablescape is now a focal point and has a story to be told. A story of being content with what I have. Being content doesn’t mean you have to sacrifice beauty in your home. In fact you may be surprised where you can create beauty and interest when you are thinking outside the box! There are a few examples of that type of thinking in this photo! 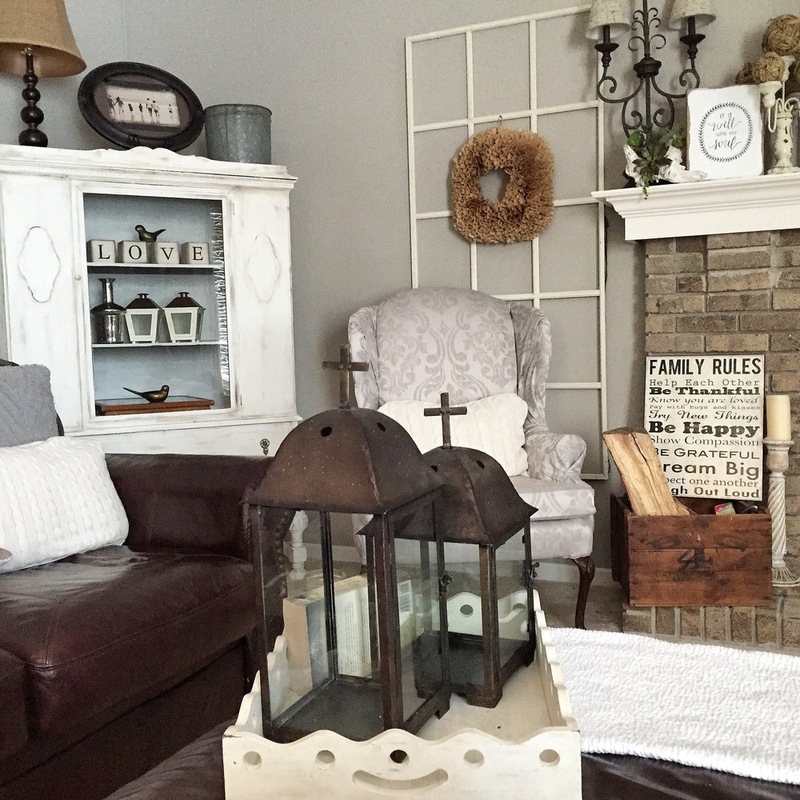 Our family room needed a facelift and like usual, it needed to be done on a budget! There are 4 main changes I did here that created a huge impact, or added to the design element without breaking the bank. The first is that cabinet in the corner. We needed some additional storage in this room but a new piece of furniture even from a discount store could really eat a big bite out a small budget. I found this at an antique store and because it had slight water damage, the owner had it marked way down to $100! Some white paint, and a little sanding and she’s as good as new! The next item is the wingback chair. I had a desire for more seating besides our beast of a couch and the hubbys beloved recliner. Again, accent seating can be expensive, or if it’s in my price range it isn’t made very well. Insert Craig’s List and a few days of checking the ads, and I came across 3, pink, wingback chairs for $50. All 3 for $50! Sold for sure! I knew they would need recovered so I began looking for fabric...even clearanced fabric was beginning to look pricey so I had to put my thinking cap on! I came across some window treatments and I loved the print and the price and I thought, there is no rule that says you can’t use curtains to reupholster a chair! By using the window panels for fabric my cost went from $100 to $40! Now it was time to tackle the large, blank space on either side of the fireplace. We all know how expensive art work can be, and the larger the piece, the bigger the price. I took a trip to my local salvage yard and found these great interior window frames for $4 a piece! They are lightweight and hang directly on the wall with a few nails. The best part is, the hide the ugly cords that used to hang down each side from the lamps on the mantle! Bonus! The last item for budget saving decor are the wreaths hanging on the frames. These were made out of coffee filters and paper plates. They look amazing, I get so many compliments on them, and they were practically free! See, being content with what you have doesn’t have to mean sacrificing beauty in your home. Another example of finding contentment for me fell upon these stairs. It is the first thing you see when entering my home and I felt it was such an eyesore. I found myself complaining too regularly about my “lot in life” because how does one go about changing the look of your stairs? On a budget being, oh... $0!? I had actual grumbling conversations in my head with The Lord about why couldn’t we just afford to replace the carpet in our house!? How many thing that got me anywhere? I needed to change my attitude and be happy with what He had given me. The fact is, this is a beautiful, 2 story entry with a large, bright window and a pretty good size foyer. Let’s make the most of it! I ripped the carpet off and painted the wood that was underneath for a huge impact that cost me only paint! And a few puncture wounds from removing carpet tacks and staples, ouch! Choosing to find contentment and happiness in what I had instead of complaining about what I didn’t have gave me the opportunity to now greet my guests with a beautiful entryway and with the pride that I did this myself! A lesson in contentment is a hard one for sure but we are clearly called to be content. 1 Timothy 6:6-7 says, “But Godliness with contentment is great gain, for we brought nothing into the world and can take nothing out of it.” Hebrews 13:5 says “Keep your lives free from the love of money and be content with what you have, for God has said ‘Never will I leave you, never will I forsake you.’” I love Psalm 37:3-4 which says, “Trust in the Lord and do good, dwell in the land and enjoy safe pasture. Delight yourself in the Lord and He will give you the desires of your heart.” There should be no mistaking His desire for us to find happiness in where we are, with what we have. God has taken my family through many homes from a 1 bedroom apartment, to a rental home in an unsafe town, to a huge home in a neighborhood with a man guarded gate. We have been fortunate to live in a home and have the finances to renovate and remodel the house of our dreams, yet have also gone through the struggle of losing our home to foreclosure when the market fell. The important thing I take away is not the “type” of home I live in, but how I make my family feel inside of those walls. Our homes are not so much much made up of the square footage we may or may not have, the crown moldings or ceiling heights, or even builder-grade carpet verses hardwood flooring. Our homes are made out of the love we have for our families, and most importantly the moments that we let Jesus in, to dwell among us. Let’s place our happiness in Him and choose to be content with the gifts He has so graciously given.